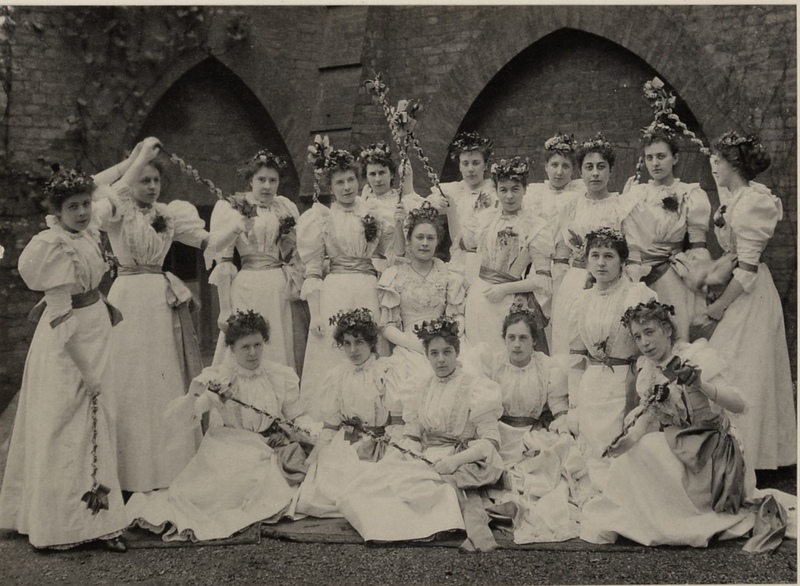 It’s that time of year again when the May Queen Festival is celebrated at Whitelands College in its current home as part of Roehampton University (May 14th) and also when I write my annual post on the College’s time at Whitelands House in Chelsea. As with horror film sequels (Ginger Snaps Back: the beginning, Evil Dead 3: Amy of Darkness etc) the third outing usually goes back in time, so this time the pictures come from the period from the start of the Festival in 1881 to 1900 when its founding father, the art critic and writer John Ruskin died. Although he never actually attended the May Day celebrations Ruskin’s influence is seen strongly in this period when the whole idea was new. For new readers I should summarise. 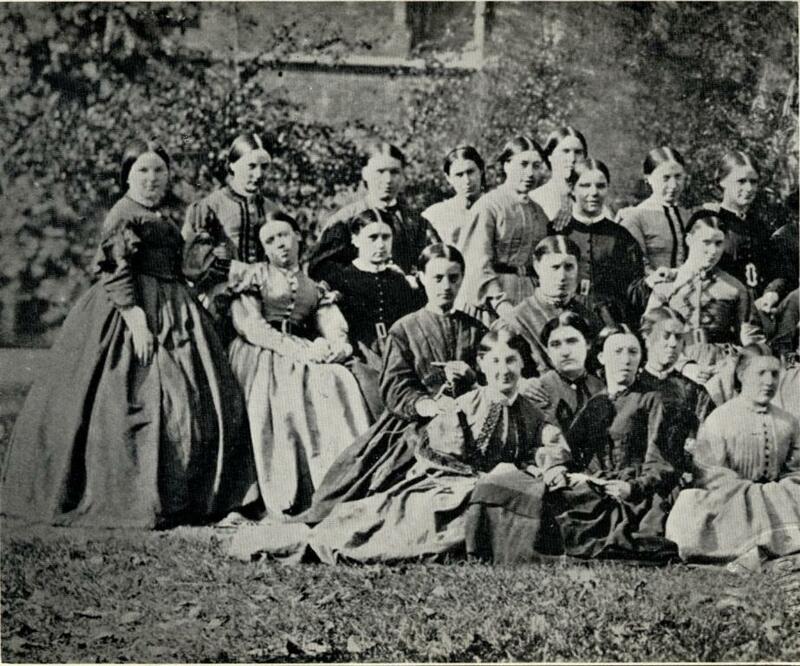 Whitelands College, a training school for female teachers was set up in 1842 and had its home at Whitelands House in the King’s Road until 1930. The College was highly successful with supporters such as the philanthropist Angela Burdett-Coutts but it was a strict regime. Charles Kingsley, father of the novelist of the same name and Rector of Chelsea reported an atmosphere of “silence, simpering and stays” at the College under a Lady Superintendent who had previously been in charge of a penitentiary. The first Principal of the College was John Faunthorpe. Academic standards were raised and the College judged to be the best in England by a government inspector. 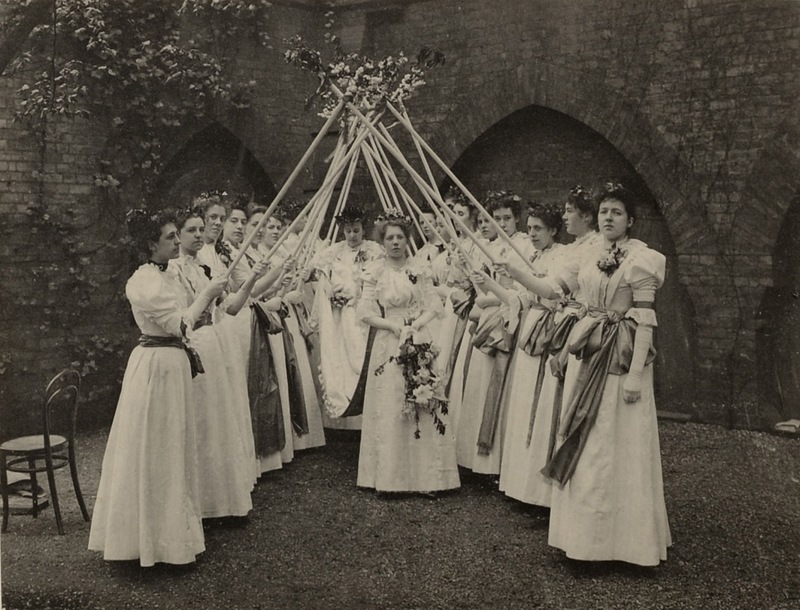 Perhaps he though the students needed something more than constant learning which may be why in his correspondence with John Ruskin the idea for a May Queen Festival emerged. It would be an annual event which would combine Ruskin’s romantic ideas of old English customs and rituals with the High Anglican tradition of the College. Between the two of them they glossed over the wilder pagan / medieval versions of May Day. 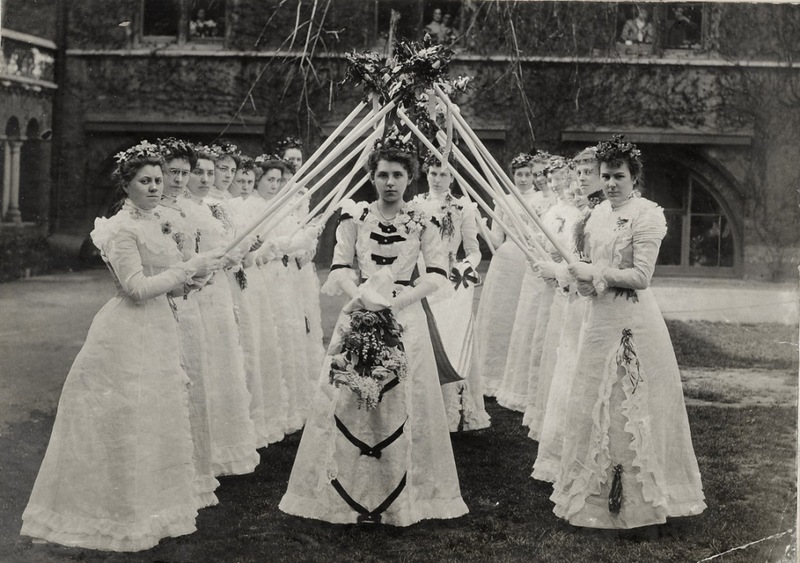 Each year there would be an election and the student judged to be the “likeable-est and the loveable -est ” (Ruskin’s words) would be crowned May Queen and reign for a year. I’ve covered this in my first post but to give you an idea of the tone of the early festival here is a quote from an article in the magazine Leisure Hour from 1886 which tells how the students idolise Ruskin (“the Master”) and how Ellen, the first Queen reacted. “The choice fell on the only girl present in black. She was mourning a dead father. The trembling maiden required some persuasion before she would consent to don the May Queen’s shining attire; and her first act after doffing it was to send off the pure white lilies that had surrounded her, to lie on her father’s new-made grave.” By suggestion the author of this piece links the festival with virginity and death. 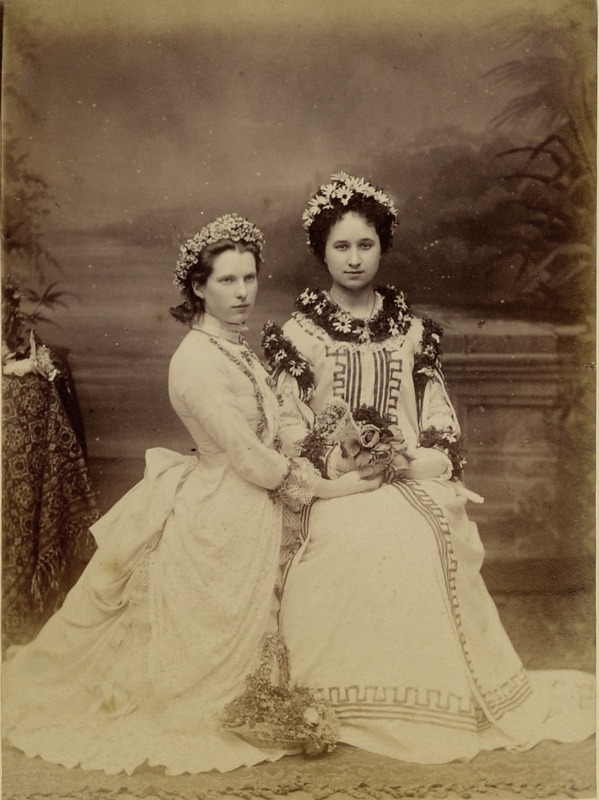 You can imagine that the May Queen was an idea which appealed to the idealistic (or sentimental) view of young women which many Victorian men held. But you can also imagine that this was also an idea which the students themselves would appreciate. A day of processions, singing and dancing with one of them getting to be a May Queen, gifts of books for all the Queen’s companions and new white dresses all round. No lessons or exams all day. What’s not to like? And of course, as regular ceremonials do, the Festival got more elaborate. Once you’d been a Queen you were part of the history of the College and part of an elite sisterhood, and the former Queens got to come back and take part again. 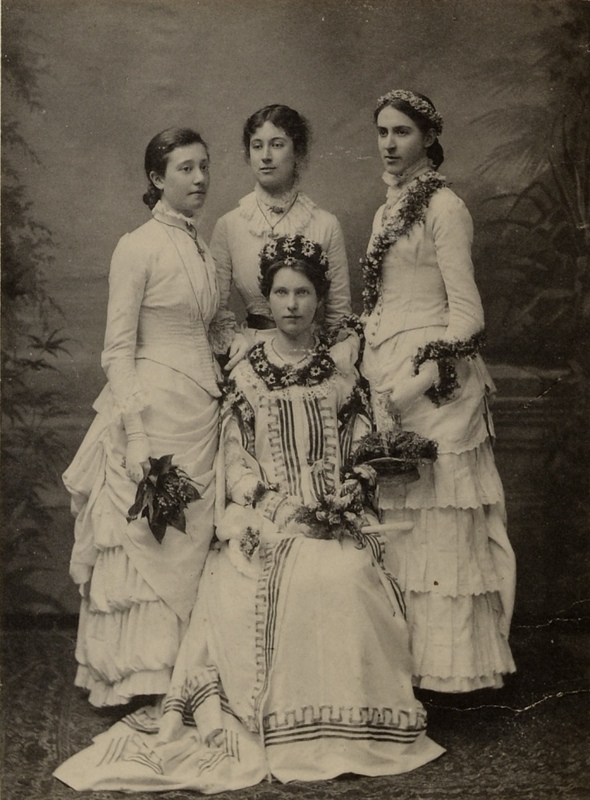 These are the first four queens, Ellen (centre back, now out of mourning), Gertude, Edith and Minnie, in 1884. Minnie is wearing a dress which was worn by each queen from 1882 . It’s quite suitable as a robe of office but of course it meant the previous queens had to go back to ordinary white dresses. Minnie was back in civilian dress the following year. Dowager Queen Minnie is kneeling before her successor Queen Rosa in an act of homage which the annual photographs show happening every year as the old queen makes way for the new. 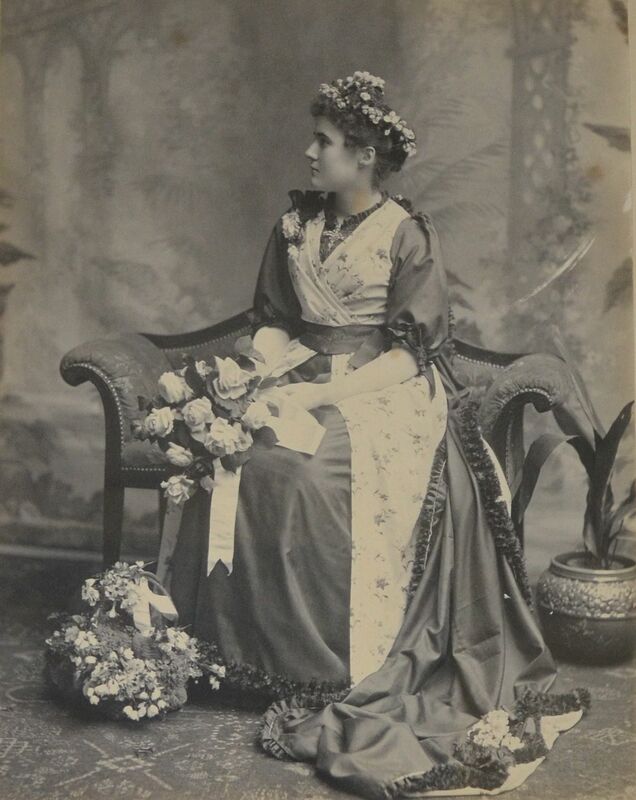 From 1888 the Queens used a dress designed by Ruskin’s friend and protege Kate Greenaway A green underskirt had been added to the queen’s robe. In this picture Queen Elizabeth I kneels before Queen Margaret. Below the Queen and her attendants, wearing mostly white versions of ordinary day dress, carrying the long sticks or staffs used in some of the ceremonies. The Queen’s companions are called her chamberlains or sometimes her bodyguards. 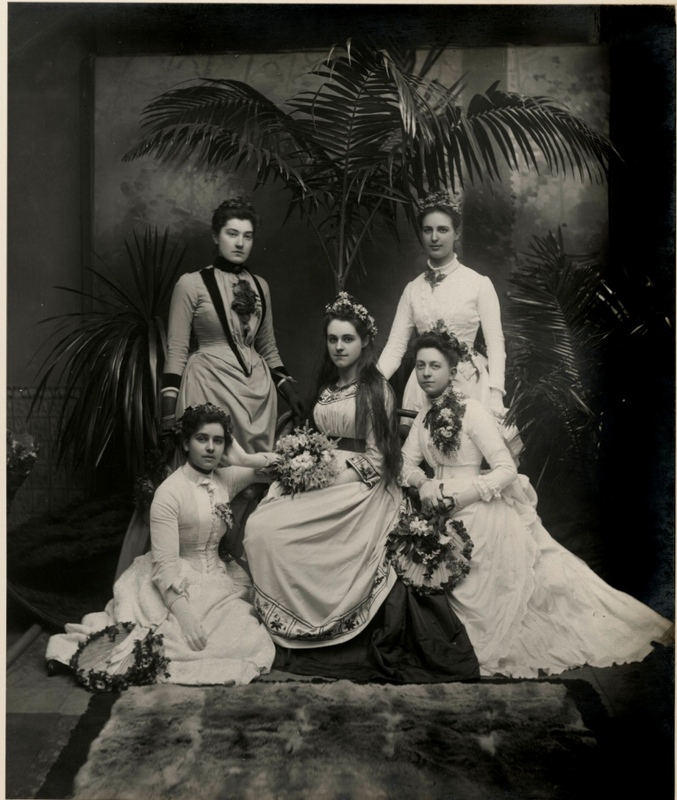 The picture below is of Queen Annie with her own entourage in 1888. 1888 was the year that local resident Oscar Wilde and his wife Constance attended the Festival, back in his respectable days. 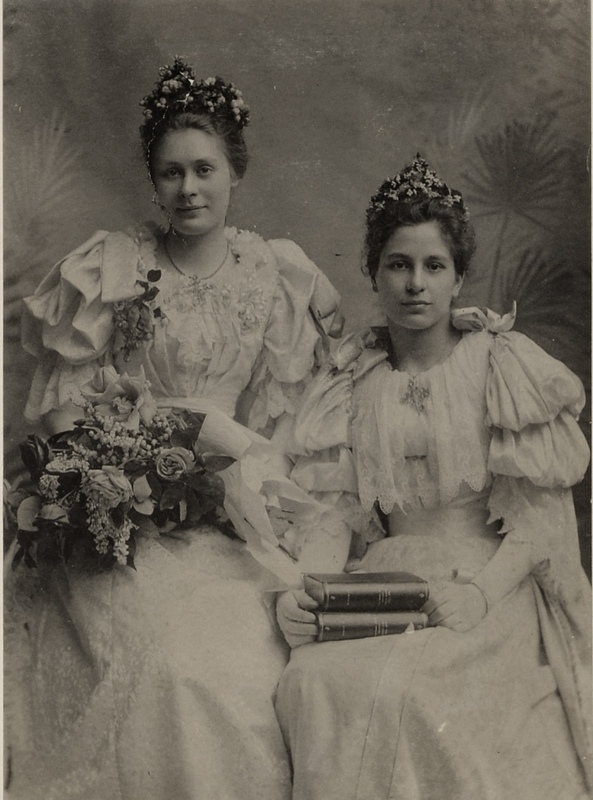 Constance returned in 1892 and 1894 the year one of their sons presented a bouquet. The photographs themselves are by this time I think an important part of the Festival. They help to establish that sisterhood, a group of women bound together by the ceremonies, not just the queens but all the students. Although you glimpse the exterior world in the background of some of the pictures, you can also sense the atmosphere of a place apart. In the pictures the pagan associations of May Day seem to emerge. 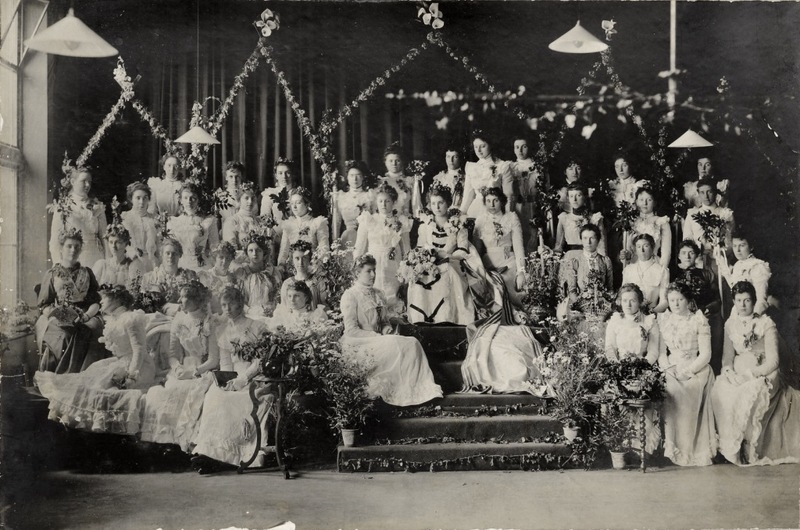 A court of women in white decorated with flowers.. a new queen on a throne, renewed each year. A ceremony which might mean one thing to the clergymen officiating and another to the women around them. But let’s not get too Picnic at Hanging Rock. 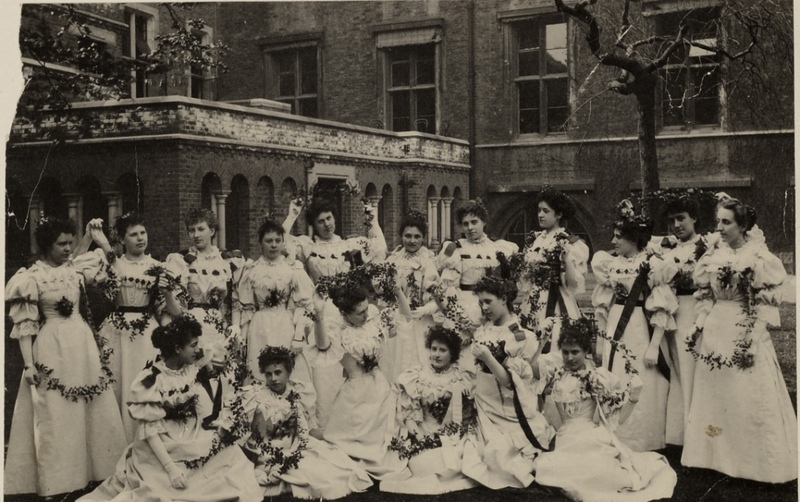 Revellers, with Queen Elsie, against the background of an ivy strewn gothic wall. In front of the same wall, the attendants, with their own special uniforms. The Queen now has a train like a bride which has to be carried by an acolyte. 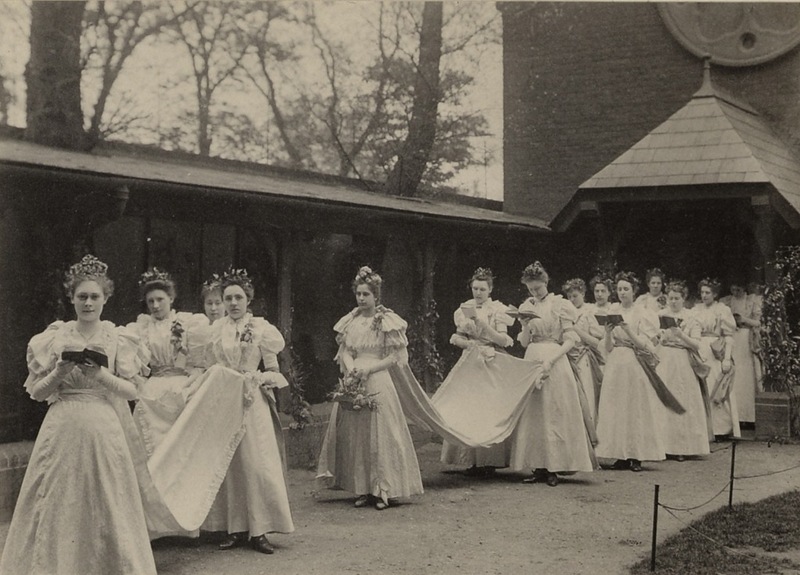 The procession from the Chapel featuring the outgoing and incoming queens, and as time went by any others who could attend. 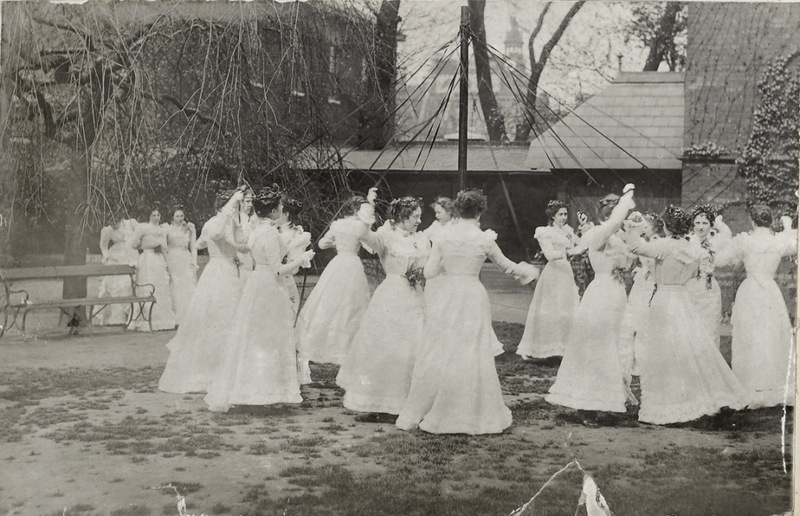 The Maypole dance. You can just see something of the real Chelsea in the distance as the age-old dance goes on. The 1900 Queen, Eveline. Below, she sits on her throne with her court of attendants and older queens. Photographs of the May Queens, and the celebrations have an undeniable charm in themselves, a romantic notion of a hidden place separate from the world outside. Think Hogwarts, or Brakebills or any boarding school story. The pictures are timeless because like fancy dress or theatrical costumes they show women out of their own time and hence more like the women of any time period. Quite a few of the pictures remind me of the 1970s era of folk music, pastoral psychedelia and mystical cults or movements. (Did you hear that Radio 4 programme Black Aquarius the other day? It covered a whole area of modern interest in the occult in films and television. A May Queen festival could have slotted quite easily into that imaginative zone.) For other viewers they may bring back other decades and other impresions. Probably it makes you look back to when you were young when picturesque celebrations under summer skies seemed like a great idea. Actually as far as I’m concerned it still does, so I’m pleased that the May Queen (Or May Monarch) festival still goes on. The two of them look elegant and confident as though the women, students and staff. had finally taken control of the direction of the Festival. Their dresses look a little like the one Lady Gertrude Agnew wore in the painting by John Singer Sargent. The picture also has a certain luxuriousness about it, or even sensuality. This is our moment, they seem to be thinking. As I’ve covered in two previous posts, (here and here) the celebrations carried on getting more elaborate and serious in the Edwardian era reaching a kind of conceptual peak then, and more light hearted after WW1. The May Day Festival is capable of supporting many flights of fancy and perhaps a few moments of insight from me and others. 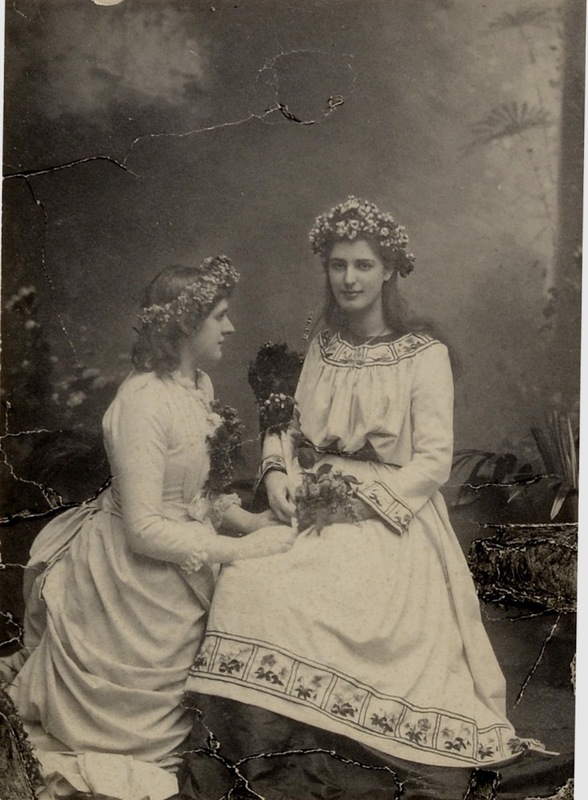 I’ve assembled a large number of images on the subject from the Library’s collection and the Whitelands College archives thanks to the help of the Whitelands Archivist Gilly King who graciously allowed us to have copies of the photographs from the May Queen scrapbooks. My thanks to her. 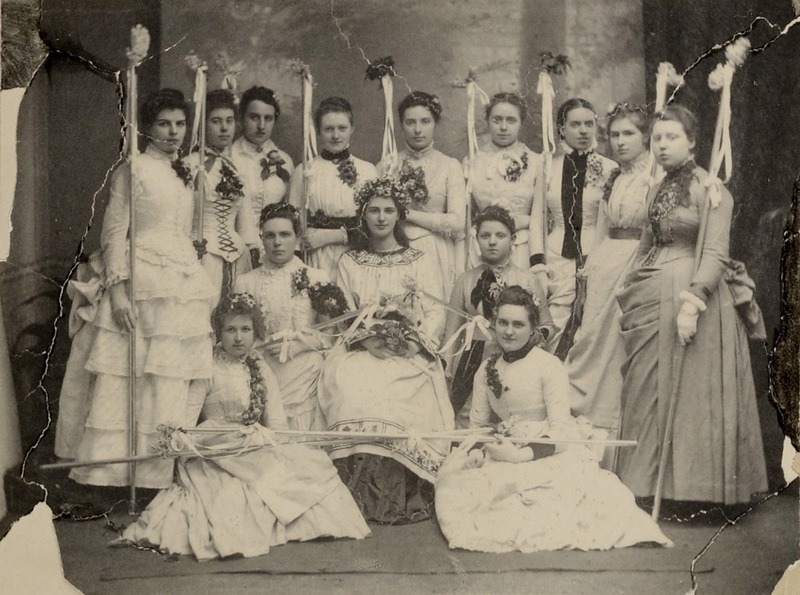 One thing I haven’t mentioned is that the series of images of group photos of May Queens of different years allows you to see individual women as they grow older. Matching them up can be tricky at times.I’ll take you through some of them one day. Maybe that’s next year’s angle. Obsessed, Moi? This entry was posted on Thursday, April 30th, 2015 at 12:09 am	and tagged with John Faunthorpe, John Ruskin, May Queen, Whitelands College and posted in 19th Century, 20th Century, Chelsea. You can follow any responses to this entry through the RSS 2.0 feed.